If the poet says that he can inflame men with love..the painter has the power to do the same…in that he can place in front of the lover the true likeness of one who is beloved, often making him kiss and speak to it. Flawless chalk-white skin, porcelain-fine features, and a reserved, somewhat impenetrable expression reflect the refinement of the 16-year-old Ginevra de' Benci. Like most portrait subjects of the Renaissance, she was from a wealthy family, and educated. She was also known as a poet and learned conversationalist. Young women of the time were expected to comport themselves with dignity and modesty. Virtue was prized and guarded, and a girl’s beauty was thought to be a sign of goodness. Portraitists were expected to enhance—as needed—a woman’s attractiveness according to the period's standards of beauty. Why was this young woman’s likeness painted? One possibility is that the commission was occasioned by her betrothal. Ginevra married Luigi Niccolini in 1474. Another likelihood reflects a cultural phenomenon of the Italian Renaissance period—platonic love affairs between well-mannered gentlemen and ladies. Such affairs, often conducted from afar, focused on effusive literary expressions that displayed the courtier’s and lady’s sophistication. May Ginevra shed tears as you go, Bembo. Every difficulty may hinder your journey. 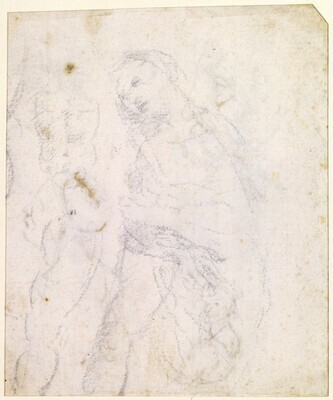 An early work, completed when Leonardo was 21, the painting shows an incipient genius and was revolutionary in the history of painting. 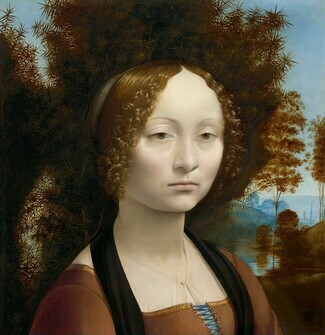 One of Leonardo’s contemporaries wrote that he “painted Ginevra d’Amerigo Benci with such perfection that it seemed to be not a portrait but Ginevra herself.” Its lifelike and forthright portrayal broke with conventions of earlier Renaissance portraiture of women, including a preference for the more detached profile view. Ginevra de’ Benci is one of the first known three-quarter-view portraits in Italian art. She eyes the viewer directly. The planes of her face subtly modeled, she may have “come to life” before viewers in a fashion more vivid than any other painting they had seen before. 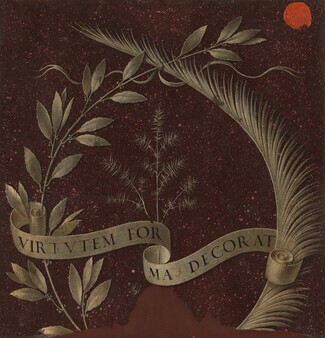 If the painter wishes to see beauties that charm him it lies in his power to create them, and if he wishes to see monstrosities that are frightful, buffoonish, or ridiculous, or pitiable he can be lord and god thereof; if he wants to produce inhabited regions or deserts or dark and shady retreats from the heat, or warm places in cold weather, he can do so. Although few paintings by Leonardo exist in the world today, among them are the best-known and most highly revered paintings in the Western tradition: the Mona Lisa (Musée du Louvre, Paris) and The Last Supper (Sante Maria della Grazie, Milan). Despite these high achievements in painting, Leonardo would likely still be known to us today for his extraordinarily versatile intellect and creative mind. Equally skilled as a sculptor, architect, urban planner, inventor, anatomist, military strategist, and visionary who anticipated the invention of aircraft, submarines, and other technologies centuries before their invention, he was among the most influential figures of the Renaissance in Europe. Leonardo was born in 1452 in the Italian village of Anchiano, near Vinci, his namesake. His parents never married—his mother, Caterina, was spurned by his father, Ser Piero da Vinci, as she was from a lower social class. Leonardo was raised by his father’s well-to-do family of landowners and notaries and lived in his grandfather’s home. In 1469 Leonardo accompanied his father to Florence to become apprenticed in the workshop of Andrea del Verrocchio, the leading sculptor there. By 1472, he was an accredited painter and member of Compagnia di San Luca, or St. Luke’s Guild, a professional society to which artists belonged. Around 1482, Leonardo left Florence for Milan where he created The Last Supper and became the most celebrated painter of the day. In 1499, he returned to Florence by necessity, as Milan had fallen to the invading armies of the French king Louis XII. There, he painted his Mona Lisaand Virgin and Child with Saint Anne (both in the Musée du Louvre). Leonardo was sought after and worked for a number of patrons around Italy including Ludovico Sforza, ruler of Milan; the French governor of Milan, Charles II d’Amboise; as architect and engineer for the Borgias in Urbino; and for Giuliano de'Medici in Rome. 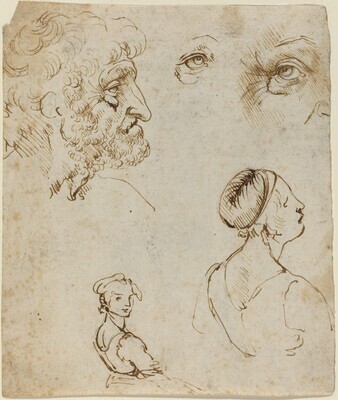 Leonardo may have met the French king Francis I, who was visiting Italy in 1515, saw Leonardo’s work, and invited him to serve as painter and architect in his court. Leonardo da Vinci died in France on May 2, 1519.